The Polish Heritage Club Wisconsin-Madison is offering a great opportunity for families to learn about Marie Curie's story through live performance: come see Storysmith Susan Marie Frontczak in Manya, her one-woman show about the life of Marie Curie. You can find all the necessary details on the poster above (click to enlarge, or click here for a downloadable PDF version). 1. $4 suggested donation--that's definitely a deal you can't beat! and 2. The performances are on October 14, the day before Lauren Redniss comes to speak at Union South. What a fantastic way to get ready for her discussion of Radioactive and Marie Curie! 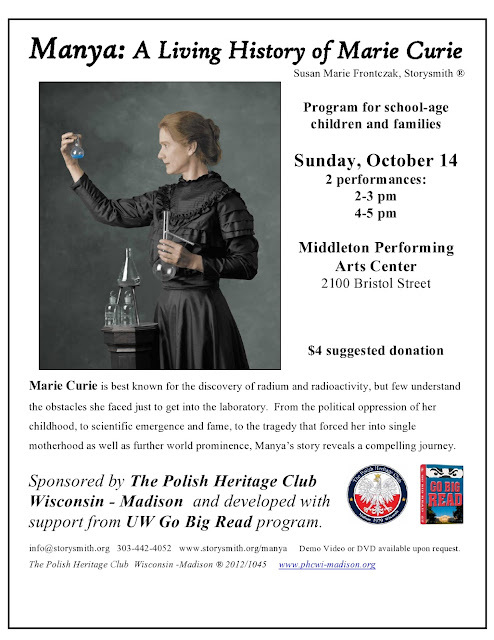 "Go Big Read marries art and science"